It was month 5 of the 15-month deployment. Originally, it was going to be a 6-month deployment. My wife was about to have our first son, and morale had been extremely low for the entire unit. Our mission had adjusted some and finally, in the heat of Baghdad, I had something to be excited about. We had been away from any of the larger bases for quite some time, and now we were going to get a few days a month on BIAP (Baghdad International Airport). After what seemed like constant missions, we were excited to get a little rest. A few guys in my unit and I were driving a Humvee on the base, and we saw a coming soon sign. The sign was for a Pizza Hut. Now to explain, pizza and I have had a longstanding relationship. These 5 months had been the longest I have been without pizza since infancy. I was so excited and drove as fast as I could to the future location. After being pulled over and receiving a warning from an MP, I arrived at Pizza Hut’s future home. In the two months leading up to the opening, I counted down the days on my calendar. I also drove to the location any chance I could to see if progress was being made. Finally, the day arrived; I had two hopefully short early missions that day. After the missions, everyone knew my dinner plans. The missions went as I had hoped, and I was on my way. Unfortunately, the same MP from two months prior gave me another warning. He threatened locking me up to which I laughed. I said, “So that means I will be in a safe cell with no combat. Is that really a punishment?” Ok, so I shouldn’t have said that, but he was between my pizza and me. We continued to the site in which I had visited multiple times leading up to that day. Upon our arrival, everything was blocked off. I thought to myself, this could not be happening. I pulled up to an MP that was securing the site, and he informed the Pizza Hut was hit by a mortar. The opening was being delayed to a later date. My heart sunk. Let me tell you, I had been shot at, away from my family, miserable at times leading up to this day, but this topped it all. How could this happen? I have stood face to face with the enemy, and they could miss with a bullet. How in the world did they find the Pizza Hut with a mortar on the day it opened? My thoughts raced, and I automatically thought this was the new style of enemy attack. We were all excited, but my friends in my unit laughed and picked on me due to my frustration. After leaving the Pizza Hut, we entered the chow hall. There my friend presented me with a drink that was no ordinary beverage. It was 8 ounces of Citrus splendor. It was my first energy drink, and it was delicious. The Army supplied Rip It, and it made up for the lack of pizza in my life. It had great taste, and it provided energy. For someone like me that did not enjoy coffee, this drink did wonders. I didn’t want too much caffeine, so I limited my intake to 1 or 2 cans a day. It became a staple for me, and amazingly, it boosted morale. My entire unit loved them, and we looked forward to getting an ice-cold one after a mission. Our communication guy explained that Rip It might have saved more lives than any of us by boosting morale and giving energy. In the military, we wanted to encourage each other and help boost morale in our unit. We did eventually enjoy Pizza Hut together. We literally did everything together, and we were willing to sacrifice our lives for each other. We were family, and we would do anything for each other. During that deployment, many didn’t make it home and others of us were sent home after serious injuries. Many of my closest friends that survived the deployment were medically discharged. The missions in May and June of 2007 were challenging days for my unit, but I will get into that in the future. Those that survived went our own ways, but we try to stay in contact and encourage each other. For many, the war they experienced frequently plays out in their mind. We have too many battling and needing hope and encouragement. Seeking help was the first step in my recovery, and now I hope to encourage others to do the same. Hope is available, and healing can occur. It requires us to reach out for help and to encourage others to do the same. Last week I was at a local gas station, and at the gas station, I found a can of Rip It. It brought back memories of those I served alongside, and I drank one in honor of those we lost. I shared a picture with my veteran friends, and I received a flood of many memories from each of them. 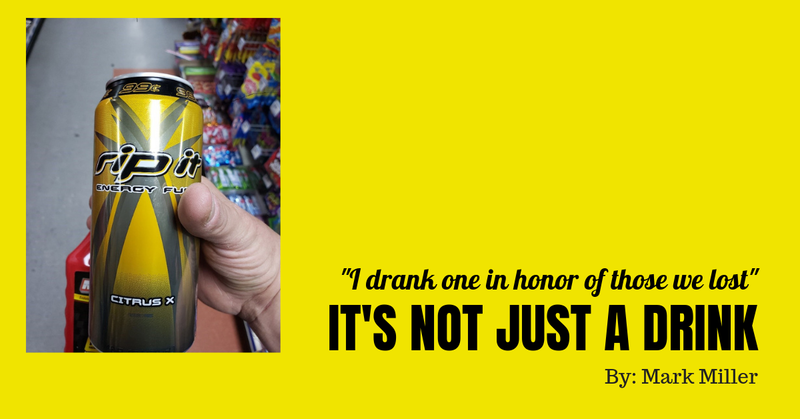 Anyone who served in Iraq and or Afghanistan knows that it’s not just a drink. Mark J Miller is an Army combat veteran and Purple Heart Recipient. He served with Special Ops and Infantry and Military Intelligence units and uses his own experience battling PTSD and my TBI to help other veterans. He enjoys Friday Night small group, hiking, being outdoors, working out, teaching, fellowship, baseball, serving others, learning new information and kayaking. He, his wife and children are a crazy fun loving family that love each other and love to serve others.